The furnishings at Shadows Lounge are covered in light fabrics and striped pillows, evoking the feel of the Southwest. Like a set of nesting dolls, the Shadow Lounge reveals its treasures in layers. 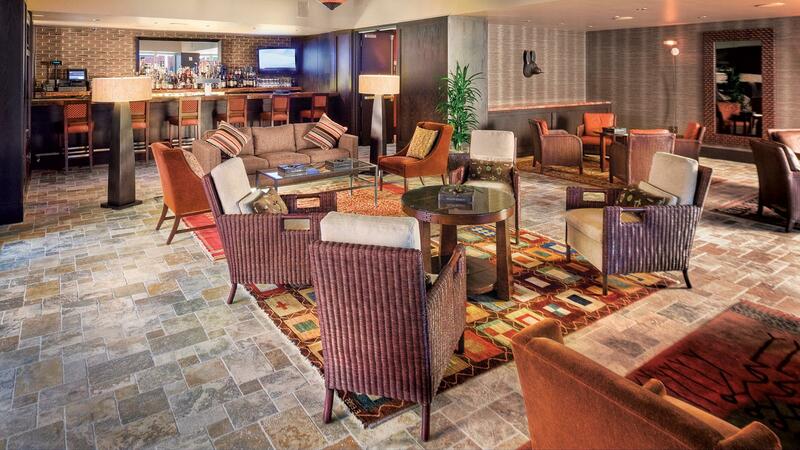 Located within the much larger Talking Stick resort complex, once you find this hidden-gem cigar bar, you may never want to leave. The entire lounge has a flow through, open floorplan concept. Immediately upon entering, a glass-fronted humidor is presented next to the main bar. To the left is a living room-like lounge space, with wicker chairs and couches, suited for live entertainment. The furnishings are covered in light fabrics and striped pillows, evoking the feel of the Southwest. And the use of natural and local materials continues throughout, with flagstone floors, woven rugs and wooden walls. An opening beyond the bar leads to an immense outdoor patio—with both covered and uncovered seating areas—large enough to host the nightly live music performances, when weather permits. The outdoor area connects to a smaller, but still substantial indoor patio, separated by a sliding glass door that opens to create a continuous open-air space. Beyond this is yet another room, an alcove set off to the side with televisions and tables. It is sort of a self-contained resort within the resort, and while it is easily one of the largest cigar bars you will ever see, it manages to keep an intimate, secluded feel. Talking Stick is a modern casino resort, featuring some of Scottsdale’s best gaming, an acclaimed 36-hole golf facility, and several restaurants. The entire facility, which opened in 2010, has a Native American design theme that honors its tribal owners, the Salt River Pima-Maricopa Indian community. The outdoor area connects to a smaller, but still substantial indoor patio, separated by a sliding glass door that opens to create a continuous open-air space. Shadows Lounge does not serve any food, but they have an impressive drink list, specializing in martinis and Scotch whisky. There are around 50 single-malt selections, including Macallan Rare Cask and 25-year-old versions of Glenlivet and Bowmore, as well as a good-sized Bourbon list. There are craft beers on draught, a fair number of wines offered by the glass, and a few bottle standouts, such as limited-edition Dom Perignon Brut "Luminous" Champagne (for $525). The table service menu includes a short but carefully selected list of cigars, including the Davidoff Nicaragua Toro, Padrón Serie 1926, and offerings from Ghurka and Cohiba. A much larger assortment is available from the humidor upon request. 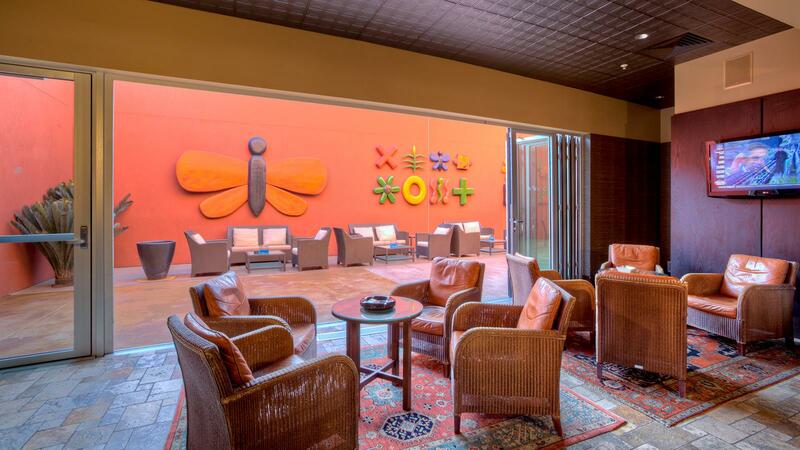 The Shadows Lounge is tucked behind the main casino floor, past the gaming tables, at the end of a long hallway tiled in peach-colored shells and decorated with original art. It makes a good spot to relax after golf, to visit before or after dinner, or as a late night last stop. Open Sunday through Saturday: 2 p.m. to 2 a.m.